Balnafoich 2 is a large boulder of schist, 4.3 m by 3.0 m by 1.5 m high, with three well formed cups at its highest points. The panel is on an east facing slope, near to the confluence of the Rivers Nairn and Farnach (just visible in the background). It is one a group of four panels. A few meters away is Balnafoich 1 which is a flat slab of schist, flush with the ground. It boasts 25 cups and is quite different in character to its neighbour. There are a number of examples of panels which are on an outcrop of rock, one side disappearing under the turf and the other a sharp step. The cups are arranged generally along the edge, for example as in Strath Sgitheach Allt an Criche 2. The panels mentioned so far are in their original locations. However many panels have been re-located, perhaps several times, and re-used for different purposes. A good example is the standing stone in Dingwall Churchyard. It is recorded in Canmore as a Pictish Symbol Stone that in 1880 was in use as a lintel over a doorway in St Clement’s Parish Church, Dingwall. It has since been moved to the churchyard where it is set upright in a prominent position immediately inside the main gate. 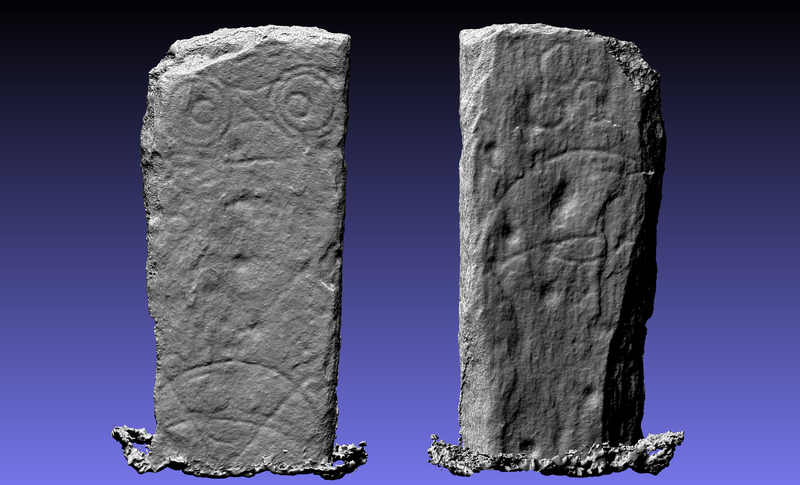 It has clearly been broken since the Pictish carvings were made and has cupmarks as well as Pictish carvings on both sides. The panel at Kinmylies in Inverness has been built into a field bank. The Highland HER (MHG54253) notes “A cup marked stone, built into a stone dyke at Kinmylies. At least 14 cup marks are visible on the exposed surface” and includes two photographs by an ‘unknown photographer’. The photographs give little clue as to the complex motifs on this interesting panel. Alternative processing and a perspective view bring out the full detail. Note the dumbbell towards the top which also has a faint ring around it. This is in addition to the 29 cups, some of which are joined by grooves, and a ‘bar’. 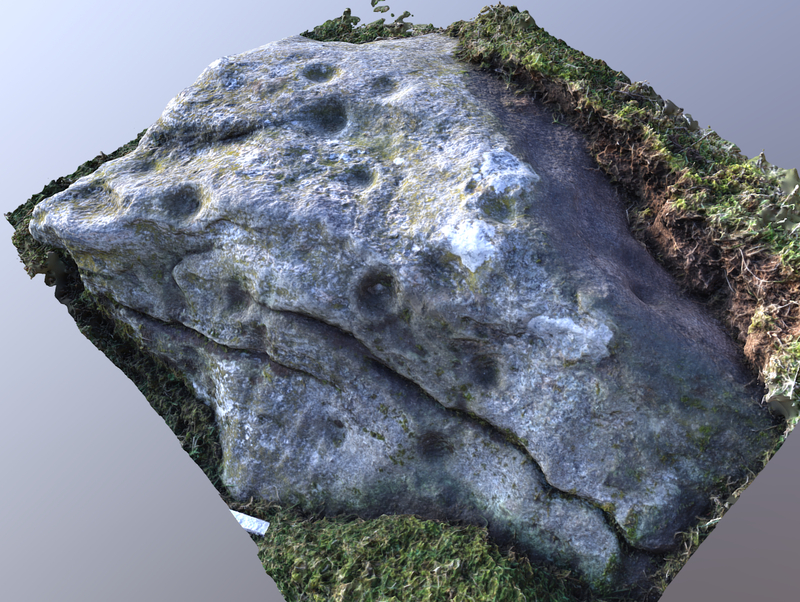 Many of the panels are very worn and photogrammetry is used to pick out details which are so slight that they are often otherwise invisible, for example at Camus’s stone in Moray. In contrast, at Balnuaran of Clava there is a panel which retains a crisper appearance. It is one of the kerbstones of the NE Cairn, at its northern edge. The stone was discovered lying face down in 1931 and has been reset into its current position. The marks made by the tools used to carve out the grooves in the fine sandstone can easily be seen. Note the ring around one of the cups at the far right of this image. Not all the panels with complex designs are on flat or flattish surfaces. 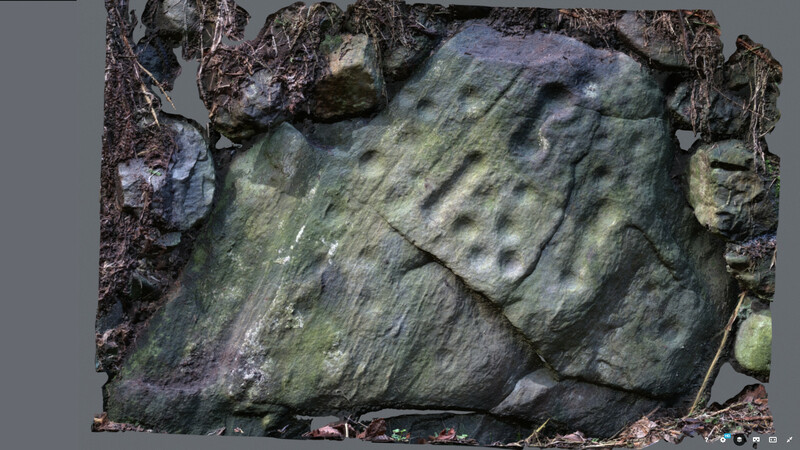 Black Hill 2, a most irregular shaped panel, is covered in cupmarks. At least one has a surrounding ring, and there are several grooves. The panel is about 70 m from Black Hill 1; a larger flat panel with at least 37 cups, a deeply incised cup and ring, and a dumbbell. Other panels have a character all of their own, such as the large flattish and overlapping cups at Fleuchlady on the Black Isle. We don’t know the reason why the panels were carved, and we can only observe and record the panels which remain today. Many must have been destroyed over the years, many are badly worn, and many have been moved. The remaining sample is small and may be unrepresentative. Despite that, as shown above, no-one can help but be struck by the variety and very different characters of the panels we have seen to date. On the simpler panels, with just one or a few cups, the cups tend to be at or near the highest point. Often there is another isolated cup somewhere else on the panel (Rogie 39, Dalreoich 1, Balnafoich 2). 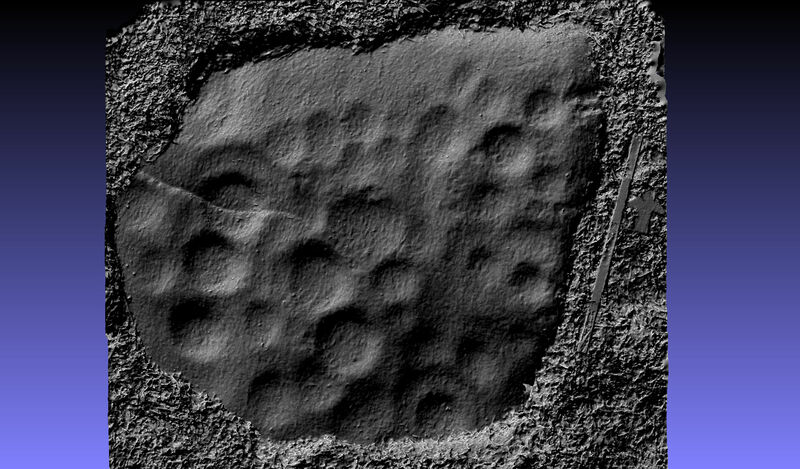 Where there are larger numbers of simple cups they are often in an apparently random scatter over a flattish surface, and often of different depths (Cnoc Bhiosta 1, Dalreoich 4). On outcrops, cups are frequently along an edge of the outcrop (various in Strath Sgitheach, and Rogie). 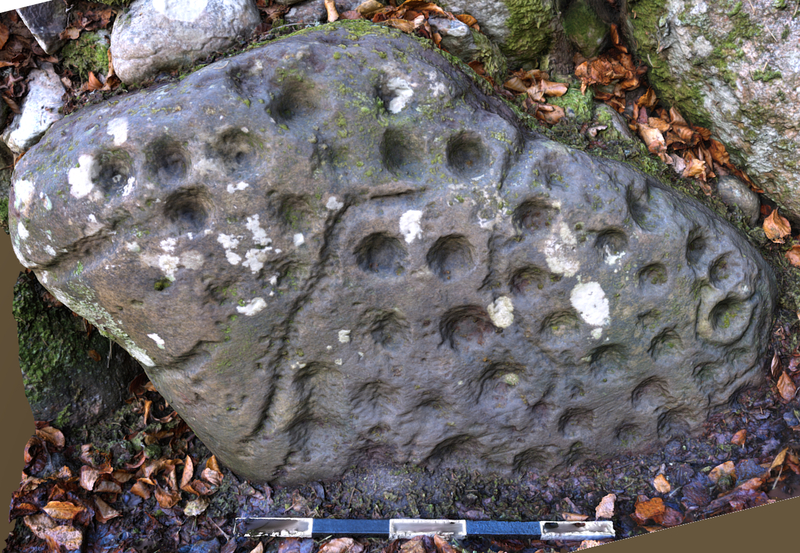 Many panels have one larger cup, sometimes with a ring (Balnuarin of Clava, Black Hill 1). The more complex panels have cups, rings, and grooves, and (so far) each has a unique character, several of which have been shown above. Many of the known panels are in groups, for example Druim Mor, Strath Sgitheach, Rogie farm, Urchany. There is no doubt that they do survive in groups today, and because of that the reply to the perennial question of where to look for new panels is always ‘near to known ones’. Many panels have obviously been moved, but when? There are eight panels built into the cairns at Clava. Some at least must have been carved before being placed in the cairn, and so were ‘moved’ in antiquity. The history of the stone in Dingwall churchyard has been outlined, from cup-marked stone to Pictish carved stone, broken at some stage, to church lintel and to standing stone. Field clearance must have destroyed many panels, but some remain such as Heights of Fodderty, now rescued and mounted at the Neil Gunn monument. Some are ‘in captivity’ in museums and gardens. Some have been moved in very recent times, using powerful farm machinery and not always very carefully (Dalreoich 4). We are told by experts that panels will usually be located on south facing slopes, or in the bottom of river valleys, often overlooking ‘good ground’, and our sample so far supports that. It is also suggested that they are often near the confluence of rivers (the Balnafoich group is an excellent example), or on route ways, although as yet we don’t have enough data for that. A major factor in our area is geology. Sandstone forms a ready ‘canvas’, and some of our more complex panels are on sandstone (eg Ardoch). However, most of the panels we have recorded so far are on a grey mica schist, sometimes with garnets. This is medium grained and not at first sight especially promising as a ‘canvas’. Some members visited Tiree and recorded the panels there, on Lewisian gneiss, possibly even less promising. And when fossicking we find a lot of boulders of coarse granitic rock with quartz, feldspar and mica crystals of 5 mm and larger, and on these, perhaps not surprisingly, we have yet to find any rock art at all. The project has three years to run (to end 2021). We have made a slow start but recording is now well underway. Our impressions will no doubt change as we visit and record more panels. Making sense of the records is challenging and as the number of records increases it will be interesting to see what Tertia and the other experts ultimately conclude from our work. 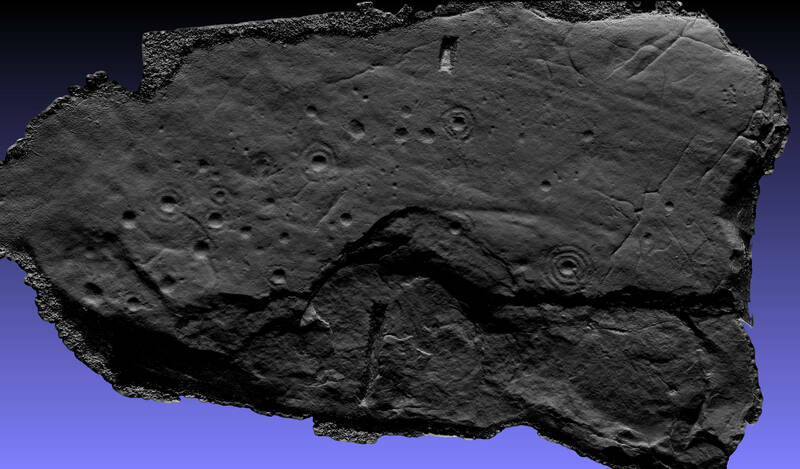 If you are interested or wonder about any of the sites named above, you can look at the panels we and others have recorded at www.rockart.scot. There is a searchable map, and you don’t need to register or log in. If you want to get involved, that is explained as well. Note on copyright. The images above have all been produced by NOSAS members. When they are uploaded to the ScRAP website the copyright passes to Historic Environment Scotland, hence © HES.